The island is synonymous with as well as famous for its mysterious stone moai. 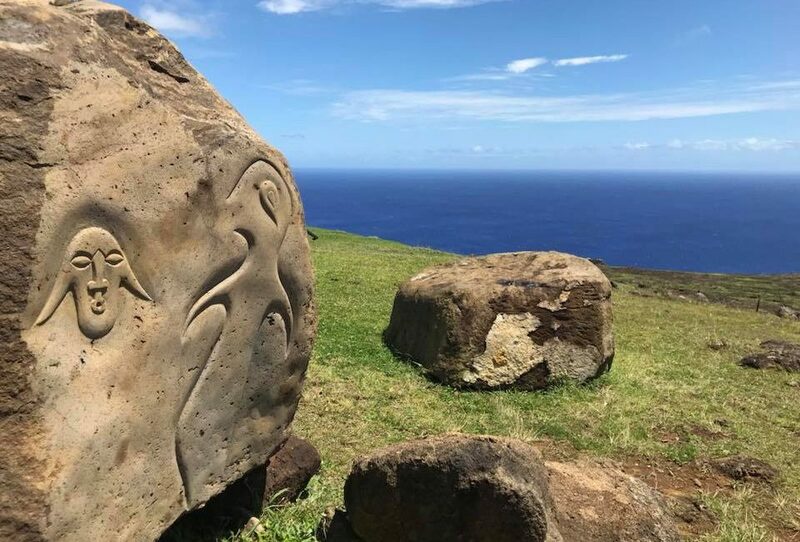 Some 900 monolithic human figures carved by the original inhabitants, the Rapa Nui, dot the island. They are estimated to have been built between AD 1250 and 1500. There are many theories on what they represent and how they were moved, but they are only just that, theories, which adds to the mystery. Whilst these monoliths are intriguing as well as mind-blowing, they are not the only allure of the island. Take the time to wander around, chat to the locals, walk along coastlines that aren’t part of the ‘tourist circuit’, stop in places that don’t have a ‘tourist marker’ and simply observe and you will be surprised to find another side of the island that you didn’t even know existed. We spent eight days on the island and enjoyed every second. We learnt a lot but most of it wasn’t what I would call the traditional lesson. 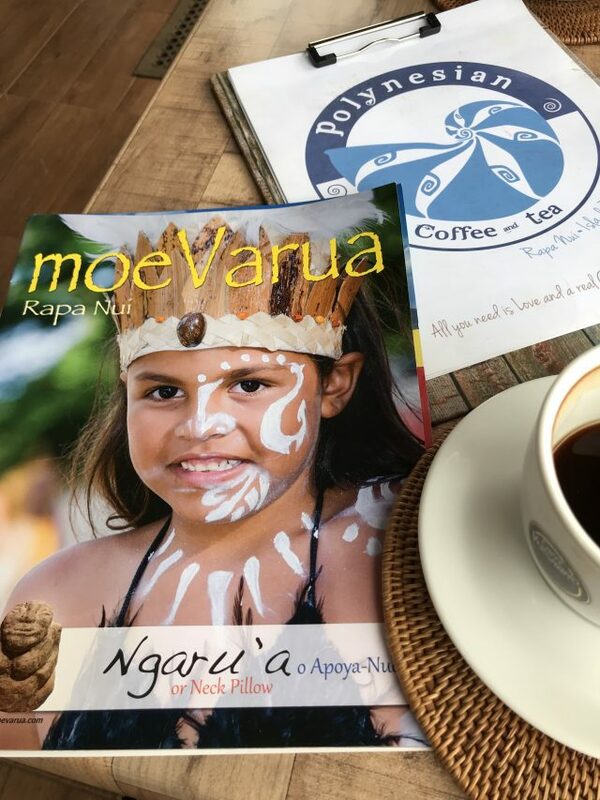 This is Rapa Nui as seen through our eyes, what we did, how we did it, what we recommend and why. 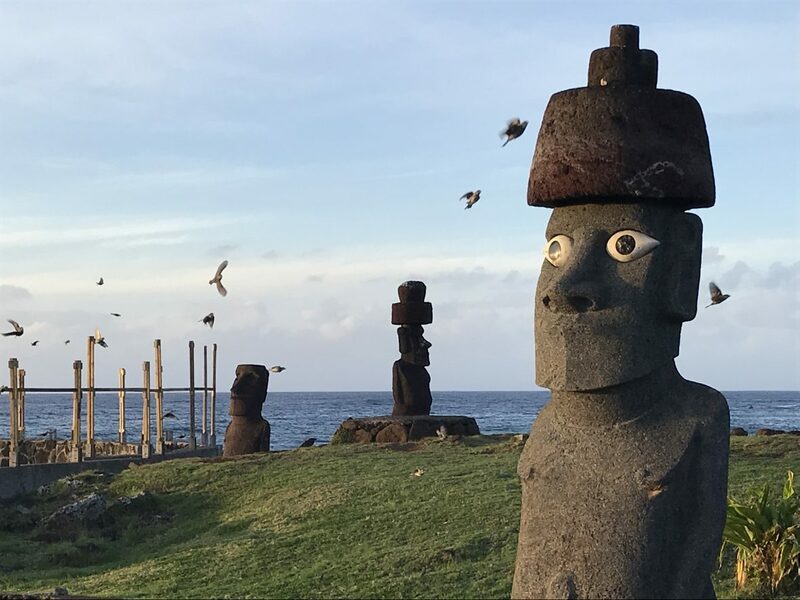 Easter Island National Park, officially Rapa Nui National Park, is a UNESCO World Heritage Site encompassing 43.5%of the island. The price and privilege you pay for that is USD $30 if you are Chilean and USD $80.00 for all other nationalities. The ticket is valid for 10 days. If you are thinking of avoiding paying and visiting the lesser known sites, think again; there are checkpoints everywhere. You can purchase a ticket upon arrival at the airport, or avoid the almost 100% of people who do this, grab your bags, settle into to your accommodation and then go the office on the main street in your own time. Supposedly all of the money stays on the island. Another story had a portion going to the Chilean government. I tried to talk to several locals as well as others living on the island as to why the price was almost three times what Chileans pay but nobody could give me an answer. The island is a trip of a lifetime, but I still think the entry fee is exorbitant. Apparently, this is under review. I urge you to voice your opinion if you so feel when purchasing your ticket. The ticket office will accept your formal feedback. Tip: The National Park office in town rarely has more than a couple of people in there at any given time. Buying your ticket there will save you lots of time as the queue in the airport is always very long. We flew to Hanga Roa, the island’s capital, from Santiago in Chile. 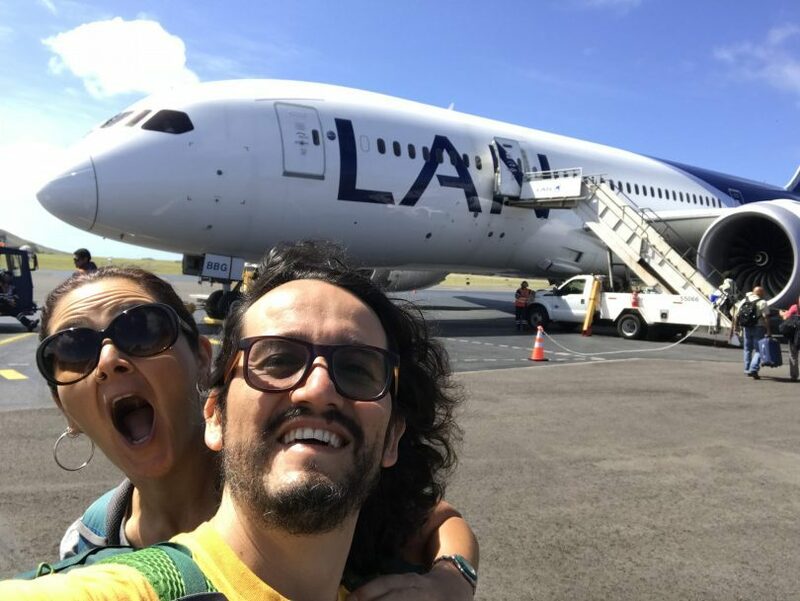 The only airline servicing the island is LATAM and prices average between USD $550-650 for a return flight. However, by booking ahead, going in off and shoulder seasons and using the Google Flights calendar function, you can view the cheapest fares. You can then go directly to the LATAM website and see if you can get a better price. Always compare to get the best deal! We tried Couchsurfing for the very first time and we loved it! We were in a central location with some great people. It also saved us a load of dollars as it’s no secret that pretty much everything on the island is costly. I would definitely recommend it as a way of both saving money and meeting some interesting folk. The island is otherwise full of a range of accommodation from top-end to budget; check the Accommodation section on our Travel Resources page. Clearly, the budget places fill up fast. We checked out Mihinoa Camping, directly in front of the sea at Hanga Piko. 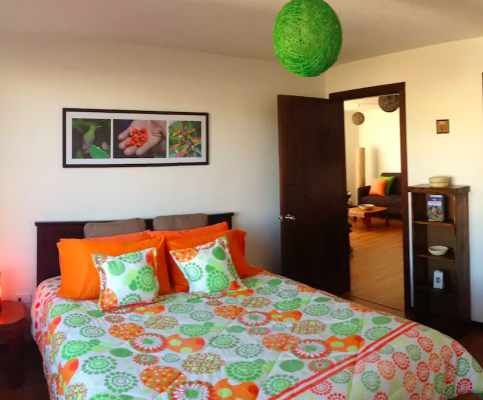 You will find everything from camping (their tents or BYO) and dorms to private rooms. The bathrooms and shared kitchens (several of both) are super-clean and the recycle facilities impressive too. The island is generally immaculate and recycling is prevalent. We loved that! Whilst you can explore some of the island on foot, you still need either a car or bike to do several of the sites that are much further afield. Sorry, no buses or public transportation here. Your options are either hiring a bike, renting a car or taking a tour. Taxis around town are also a relatively cheap option (around $2–5 dollars) but get expensive if you want to go further away. 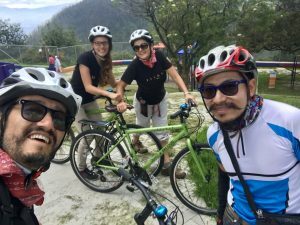 Hiring a bike is around USD $20 per day and a car $60. Tours cost in the vicinity of $60-80. 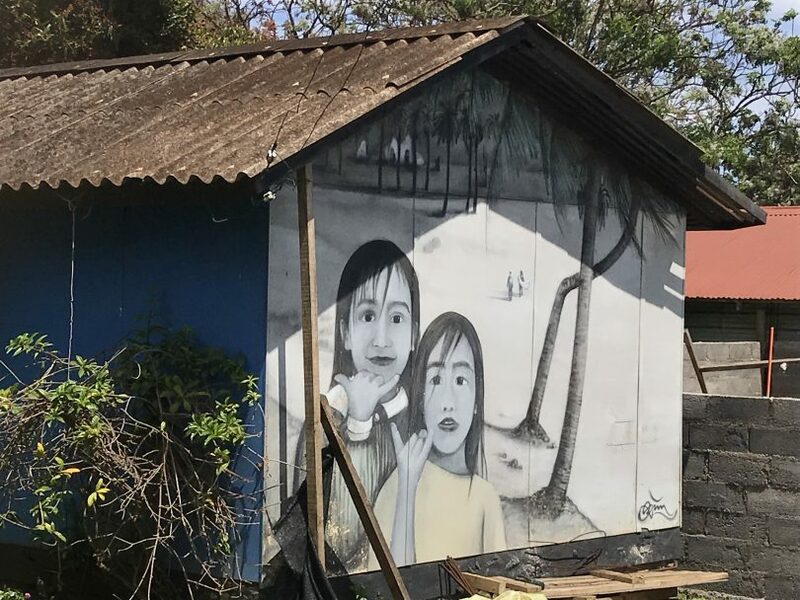 You can haggle a little bit with hiring a bike and some have even managed $40 for a car, but the island is small and people can basically charge what they wish. We were told that there is more bargaining power with the independent accommodation owners. All the car rental places on the island charge a similar price. We were there in October and people were just showing up and booking. If you are going in peak season, and your time is limited, you may want to book before you arrive. Oceanic Rapa Nui has a wide range of different vehicles. What did we do? We got lucky! We met a lovely Chilean couple on the plane coming over, hit it off and stayed in touch. On our second day, we were walking around and bumped into them. They offered to take us to their next port of call and we ended up spending the next few days with them. We offered to pay and split the costs but they would not hear of it. Over the next few days we not only shared their car but food, laughs and lots of stories and good times. 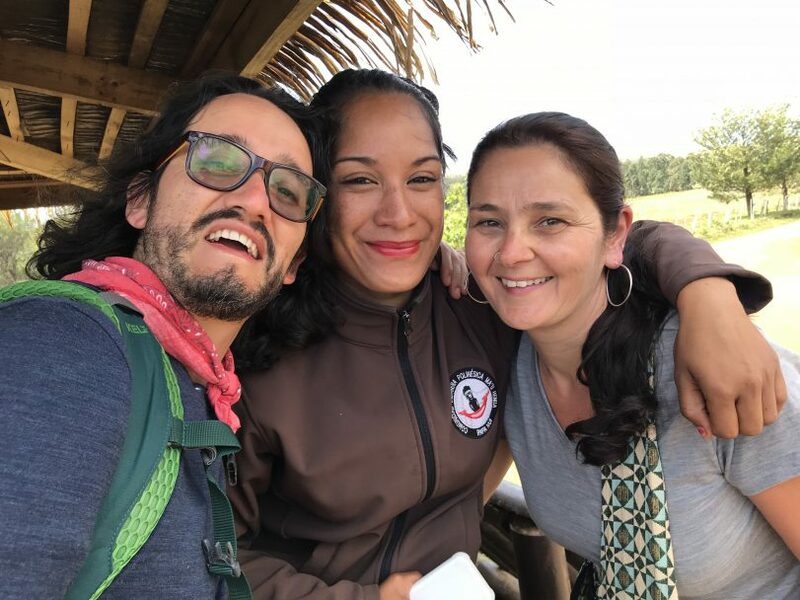 People like Eva and Ovidio are a huge part of what we love best about travelling; meeting people! Cheers to new places and new friends. Alex and I are also huge fans of foot-power and we spent several days wandering around and walking along the lesser traversed parts of the coast. Tip: Share the vehicle cost with others. People are always walking along the main road looking for a car to rent; if you are feeling adventurous, stop and ask if they’d like to share. 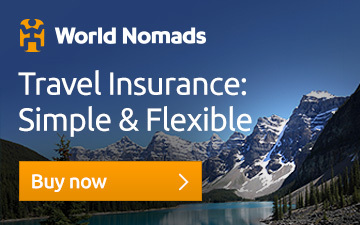 Over several days this will significantly reduce your costs. The food on the island is very expensive (think geography, think remote, think shipping costs), be it meals out, drinks, coffee, fruit, vegetables and other grocery items. We brought over our own groceries and did not have to buy much on the island at all. This saved us another stack of money. If you stick to grains like rice, chickpeas and lentils and then add the vegetables of your choice, it makes for a filling and nutritious dinner, and leftovers can be had for lunch the next day. A couple of lettuces and tomatoes, with some olives, provided our salad fix and apples were easy enough to pack too. A big bunch of bananas also went a long way. For snacks, we brought a variety of different muesli-type bars, dried fruits and nuts. We were sorted! If dining is your thing, however, you should definitely not miss out on doing that. There are a number of restaurants offering a range of cuisines. There are also a couple of places that offer shows with traditional Polynesian dancing with/without dinner. Kari Kari appeared to be the most popular one. Our reason for not dining out was not just limited to expenses, it also had a lot to do with the fact that we are vegan and choose not to eat wheat. In the ‘meat and wheat’ show that is South America, this can be difficult, but not impossible, if you are prepared to cook for yourself. Luckily, I am a creative and imaginative cook. If you need any tips on vegan or wheat-free food on your South American travels, feel free to comment below. Let’s share the love! Coffee. Ah, coffee! I am not generally a snob, but I am a bit of a coffee snob at heart. I am allowed to be, I hail from Melbourne! We have a reputation and all. We found a place called Polynesian Tea and Coffee, a cafe run by a young couple from Santiago, which make a pretty awesome coffee. They also have a range of other drinks, juices, healthy breakfasts and snacks. One of the owners told me that she could make vegan food if asked in advance. Try them out. We loved their coffee and their flexibility. Tip: LATAM allows each passenger to check in two bags of 23 kilos each. Make sure you use some of those kilos to get some food across. It will save you a huge amount of money. All of the checkpoints for the sights are patrolled by the Rapa Nui local park rangers. It was well worth the effort listening to them and hearing their accounts of how they see life on the island and how ‘being part of Chile’ has affected them. 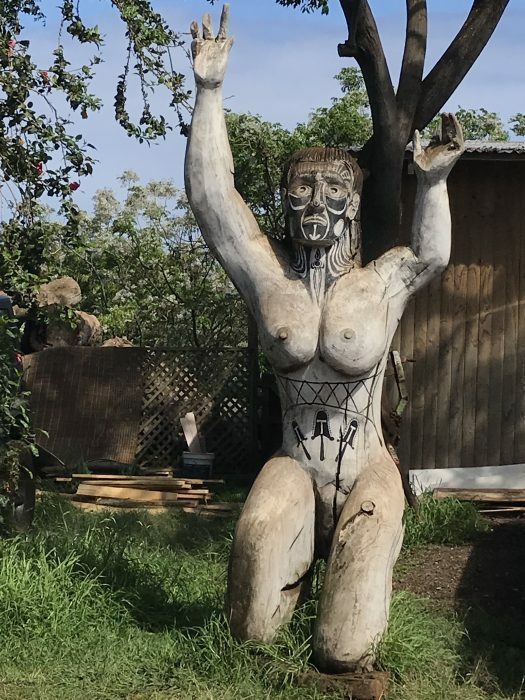 It seems like a very double-edged sword, as these situations almost always are; on the one hand they embrace being part of a country and continent that can offer them things that they would certainly not have if they were a stand-alone Polynesian country, and on the other hand they feel that their identity has been somewhat quashed. 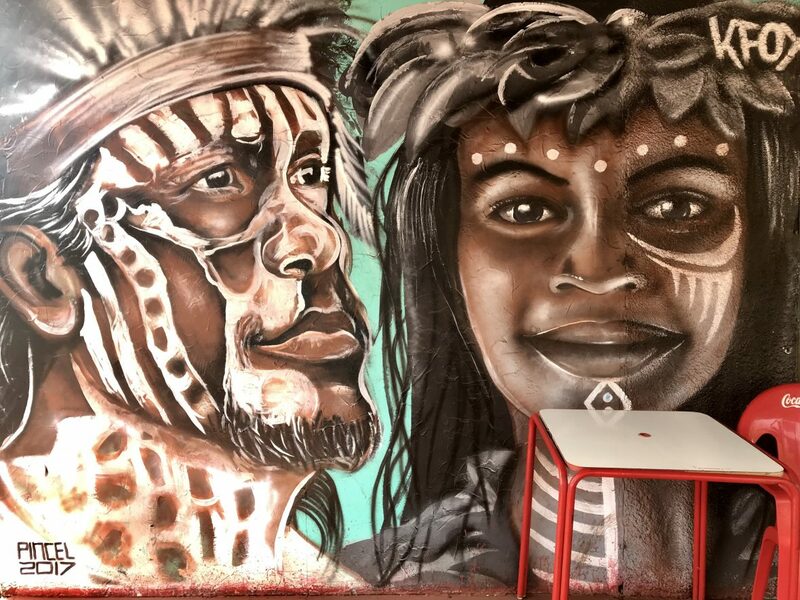 They speak Spanish and many also their local Rapa Nui, but with other nationalities and Chileans entering and staying, the ethnic mix of the island is slowly changing. 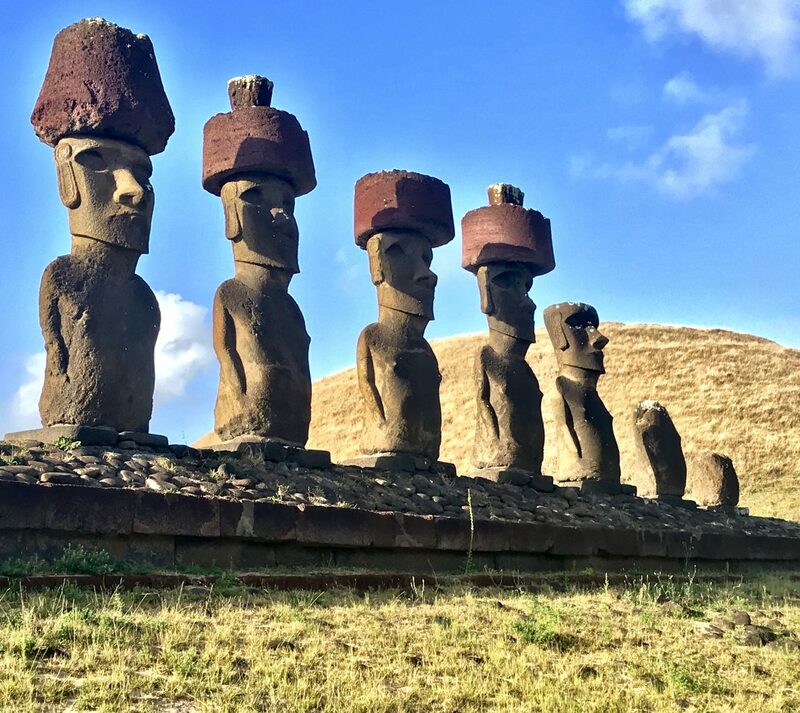 Population estimates have been put at anywhere between 6–11 thousand, and it is said that only one third is Rapa Nui. Many also speak English, so make the time to chat for some amazing insights that you may not otherwise be privy too. No trip to Easter Island would be complete without visiting the principal sites. 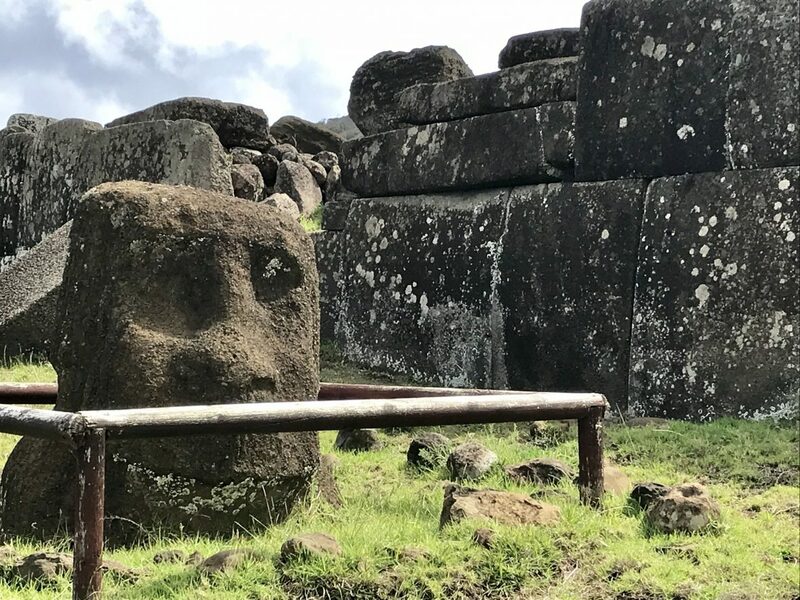 Rano Raraku (which along with Orongo are the only two places that you are allowed to visit only one time each) is a volcano and is effectively the moai quarry. 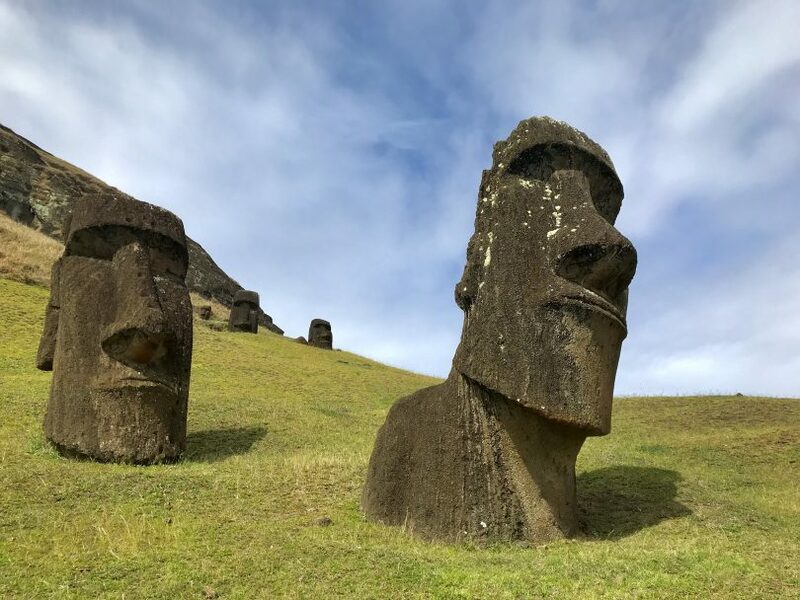 With 397 moai in various stages of development, it seems as if the sculptors simply left on a lunch break and never came back. 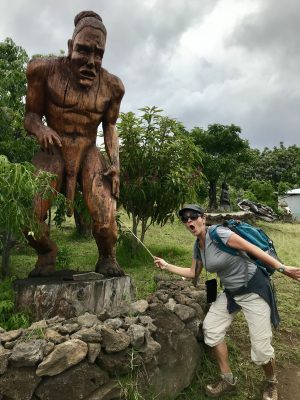 Nothing can prepare you for the arresting view as you near the site and see the volcano-dotted with the multitude of massive statues. On the highest part of the quarry is the largest moai ever found. At almost 22 metres long, unfinished and with an estimated weight of more than 200 tons, it leaves you with far more questions than answers. This site should be done leisurely; there’s a lot to take in, look at and ponder upon. There are also some great views towards Ahu Tongariki, which is the island’s sunrise go-to spot. It’s also worth the short detour to see the volcano’s crater, which is filled with water. 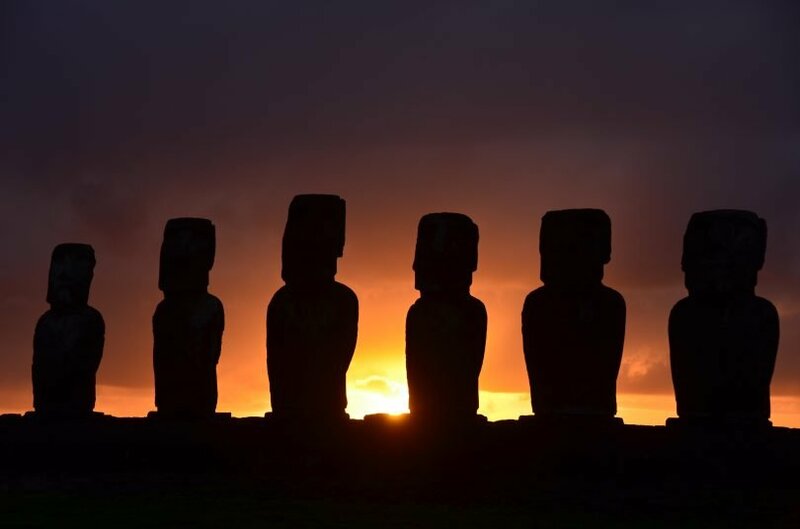 The sunrise at Ahu Tongariki is spectacular. Run, walk, cycle, take a tour … but make sure you get there! A-mazing! You will not be alone but you will not be disappointed. As the masses subside, hang around for some more spectacular shots. The energy seems all that more surreal with nobody else around. Where there is a sunrise there is also a sunset; that would be Tahai, on the other side of the island, within a comfortable walking distance of Hanga Roa. It took us three nights to get the wow factor but it was just WOW! 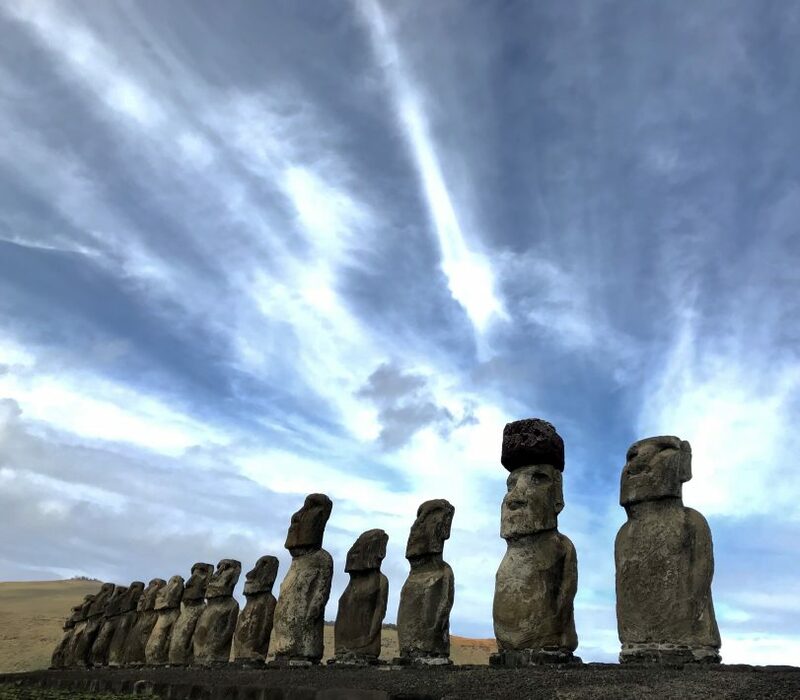 Unlike Ahu Tongariki, you are much, much closer to the water here, and it is simply spectacular if you get a clear sky. 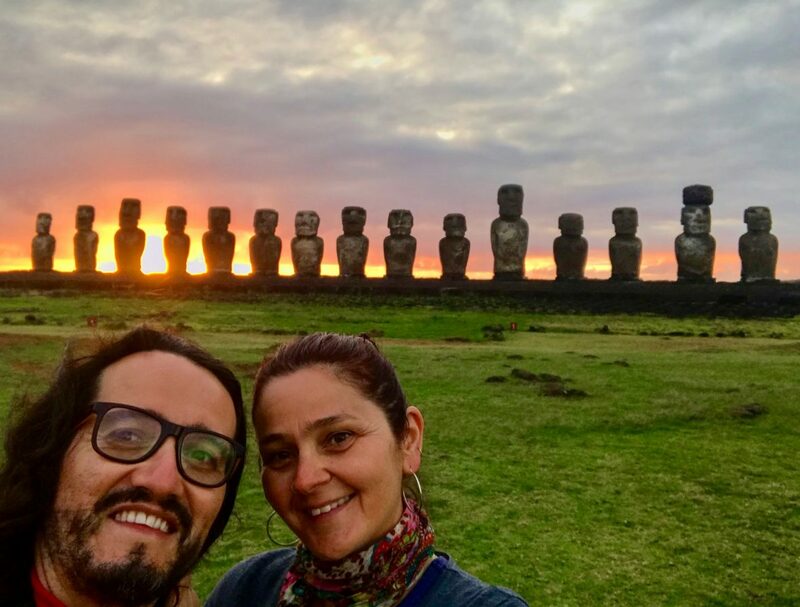 Tip: Go to Ahu Tongariki just before sunset to get some fabulous pictures of the moai stone statues as the light hits them from the front. The array of different colours is breathtaking with the contrast of the sea behind them. Anakena is the island’s only beach, and truly worth a visit. If it’s hot enough, throw on your swimming suit and bathe beneath some of the island’s many moai. Puna Pau was another interesting spot on top of the hill. It’s a small extinct volcano and is the quarry from where the stone needed to build the pukaos, or moai headdresses, was taken. Different to the stone that was used to build the moai, it’s a red volcanic rock. We also saw caves and petroglyphs scattered all over the island. The coast between Hanga Roa and Ahu Tepeu made for a breathtaking walk, with virtually no people. 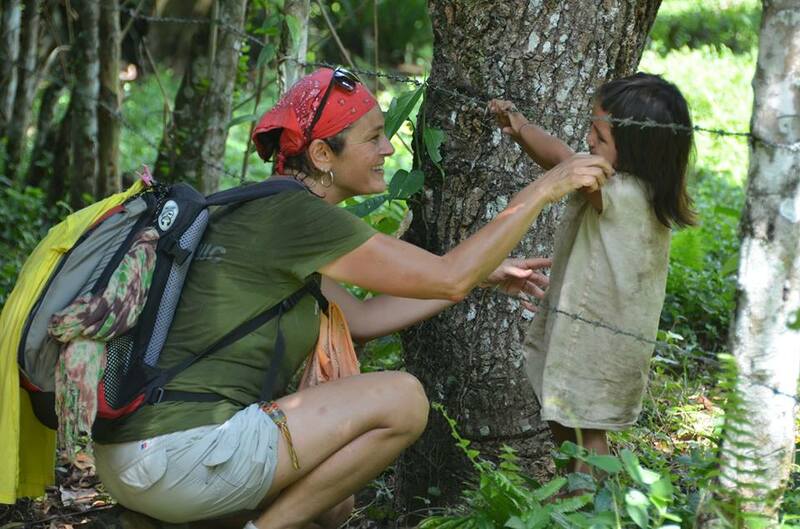 This was one of my favourite things to do on the island, as I am a bit of a sucker for just doing my own thing. It just makes exploration that little bit more exciting. Vinapu is another intriguing site. The ahu, or ceremonial site, exhibits outstanding stonemasonry, akin to the stone wall at Sacsayhuaman near Cuzco in Peru. Again, you are left with far more questions than answers. For anyone that’s been to Sacsayhuaman, you would have undoubtedly felt that tingle up your spine. Rano Kau was our favourite natural wonder on the island. 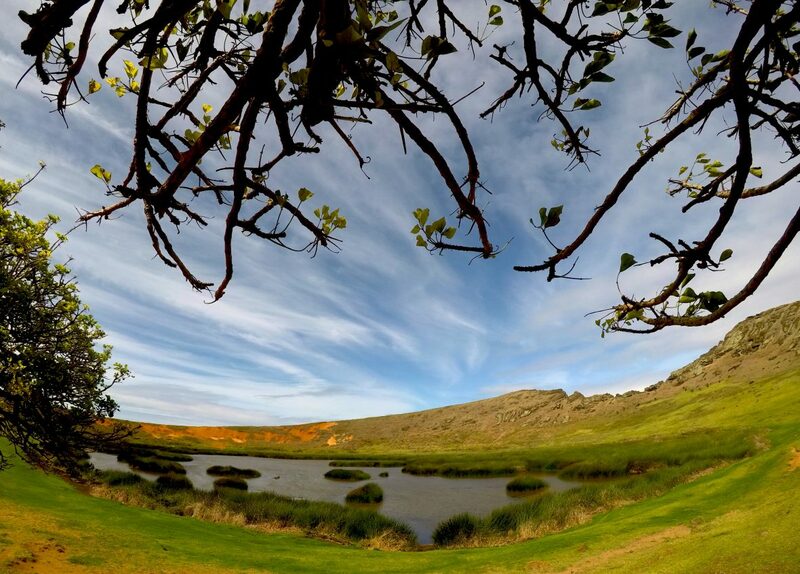 Its crater is more than a kilometre in diameter and is filled with water and a variety of plants. The viewpoint offers some inspiring views of the coast as well as the entire crater. Walk around some or all of the crater rim for different views from different angles. You will not be disappointed. 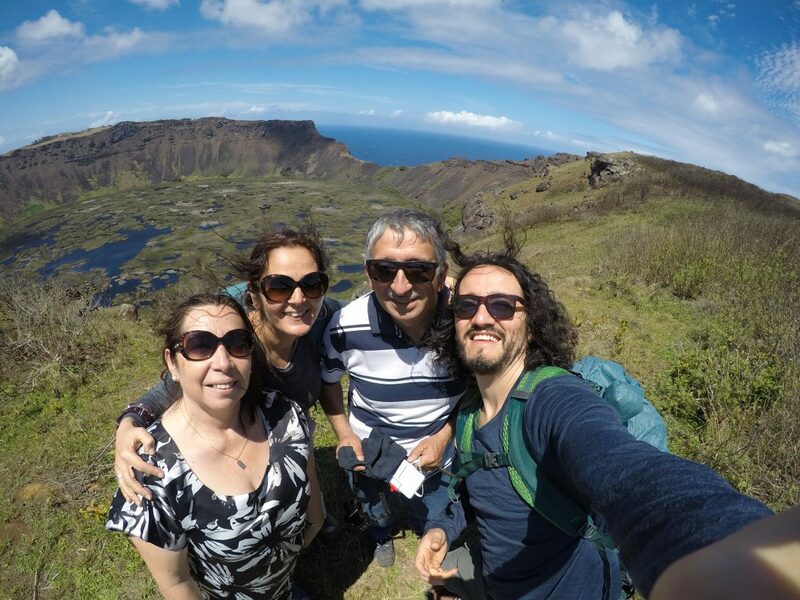 We attempted a hike to the top of Tere Vaka at a whopping 507 metres high! It’s neither a technical nor difficult walk and its drawcard is the 360-degree view of the entire island. 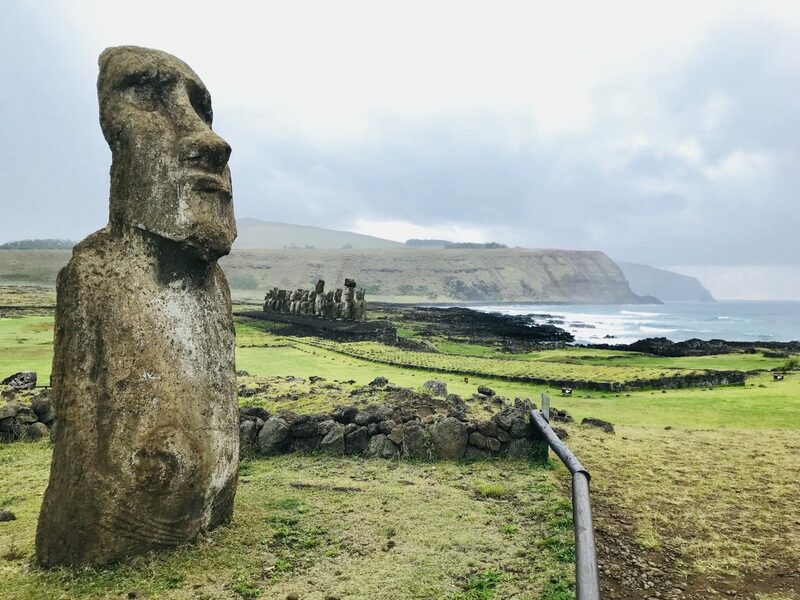 We reached its base at Ahu Akivi, the only site where the moai face the ocean, partially by walking from Hanga Roa and then being offered a lift the rest of the way. Ready to begin our walk, the skies opened and there was an alluvial downpour for more than an hour. It’s an island; always expect rain at some point. It wasn’t looking very promising, but once the rain looked like it had subsided and with our ponchos in tow (an island must-have), we thought we’d give it a crack. After all, we were going to be rewarded with 360-degree views, right? Wrong! It wasn’t the rain that was a problem. That had almost completely stopped. It was cloudy, drizzly and windy though and those little signs with yellow arrows, they just blended in all too well with the various shades of grass! We did get pretty close though and we did see around 300 degrees! Alex says 280! 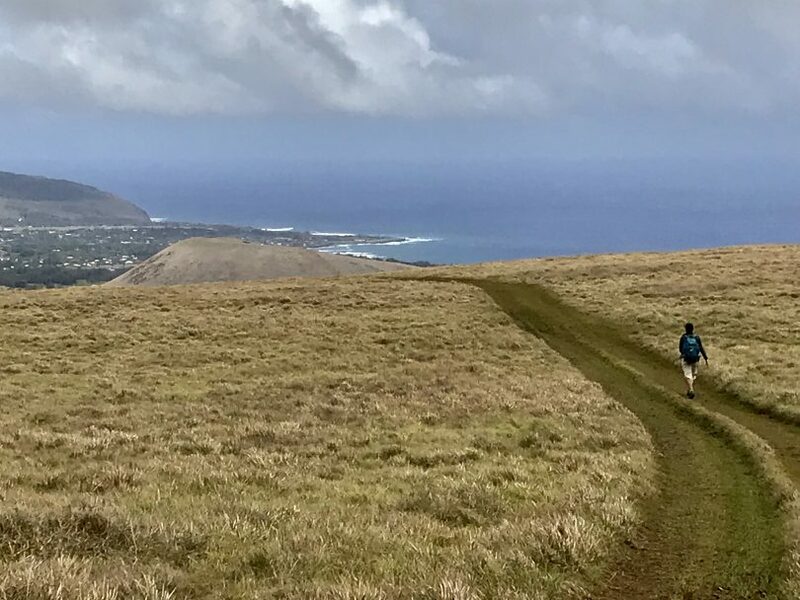 Great views and worth the approximately 2– 2.5-hour round-trip walk from Ahu Akivi. Highly, highly recommended! Just keep your eyes peeled for those little yellow arrows! Around Hanga Roa, you should definitely not miss out on visiting the Holy Cross Catholic Church. Established in 1937 it’s definitely unique. The facade was fascinating; a blend of European colonial meets Polynesia. We also made it to the 9 am Sunday mass in which songs are sung in Rapa Nui and the priest wears a Polynesian headdress. Well worth the cultural experience even if you’re not a churchgoer. 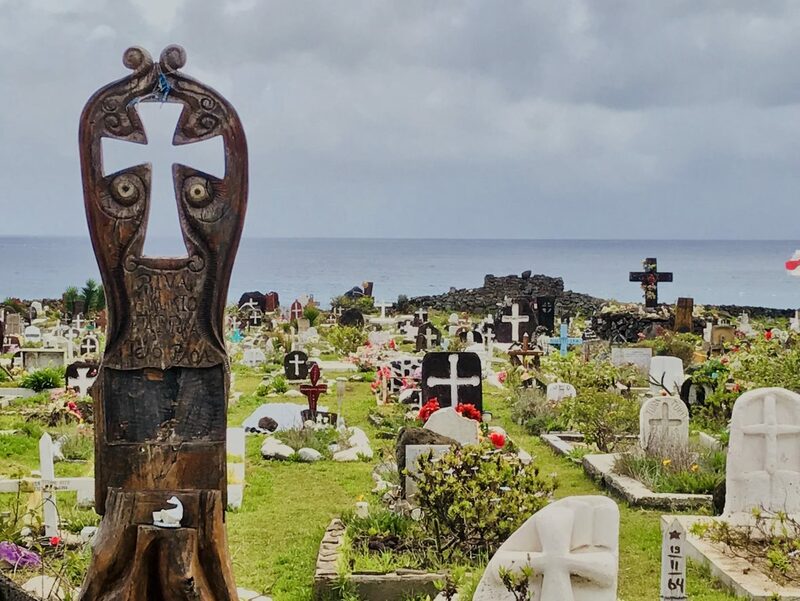 The cemetery, right on the waterfront and also within walking distance from the centre of town, is another interesting and peaceful addition to the usual itinerary. We also enjoyed the Father Sebastian Englert Anthropological Museum, for some interesting information and island artefacts. You can also visit the Tourist Office, which has a plethora of information, maps and discount deals on rentals and a few other things. Tip 1: Go to the Tourist Office before you visit all of the sights, so you have a bit of background knowledge. It’s FREE. Only one other thing is! Tip 2: Go to the local post office and have your passport stamped with an official Easter Island stamp. Although it’s FREE you may be asked for a donation. So what about the budget? Reflect on the fact that you are on a remote Polynesian island in the Pacific, quite literally in the middle of nowhere. This is a unique opportunity and you should treat it as such. Do the things that you most appreciate and enjoy and do it your way. Make sure you give yourself an extra couple of days that don’t include sightseeing … it’s the in-between stuff that is often the most rewarding! 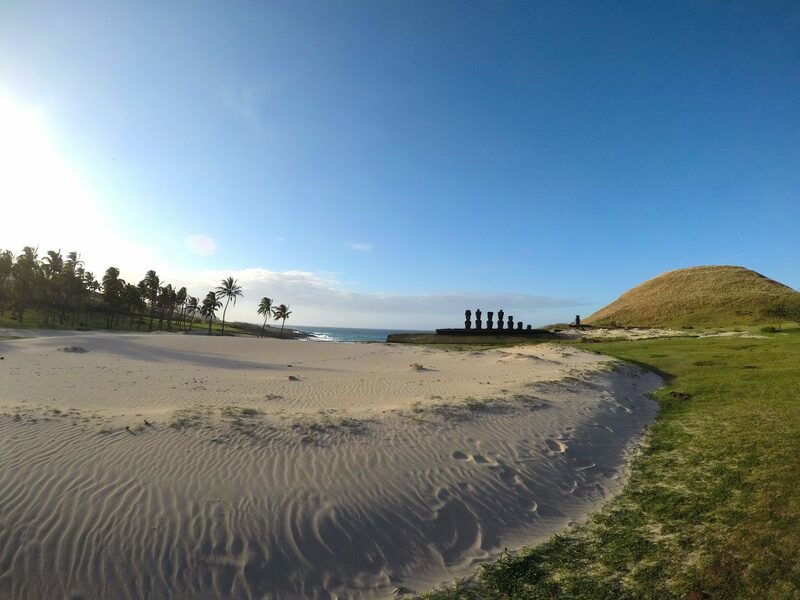 Do you have more tips, advice or suggestions on what to do on Rapa Nui? Please feel free to share your thoughts and comments below. 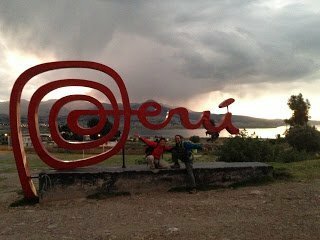 Peru … the whirlwind tour. Great work Alex and Ombi. Lots of really useful information. Wonderful photos. Hope to get there someday soon. Wow, Easter island is on my bucket list! Awesome article and photos! It really is a truly amazing place. 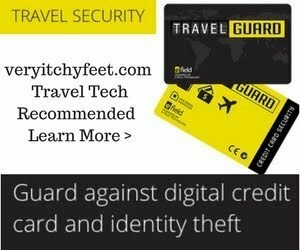 You can also find us on FB under the same name, veryitchyfeet.com That’s the place we post more up-to-date snippets of what we do and where we are at. Que hermoso viaje, que rico que disfrutaran mi tierra.! Lo siento por no haberte contestado antes. Que bueno que te gusto el articulo. 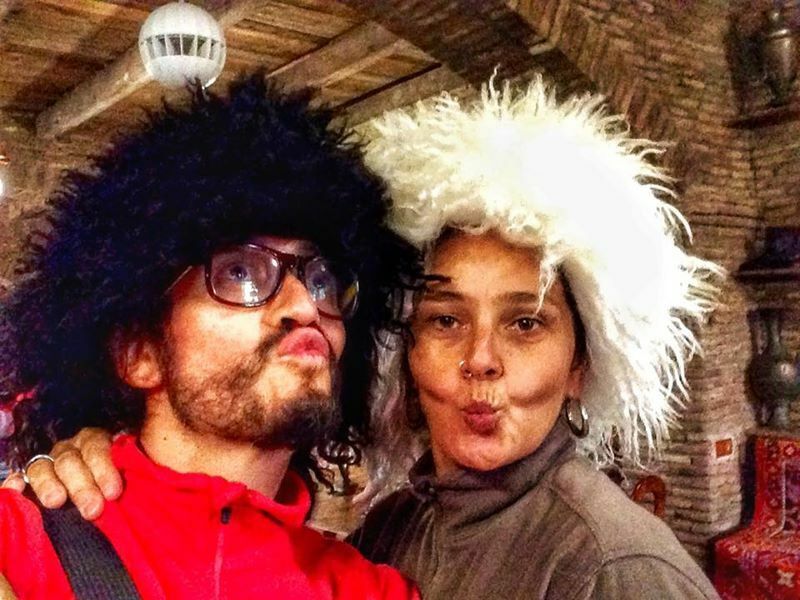 A nosotros nos encanto tu tierra y su gente.